Now if I was an Android user I would be jumping all over this news because I am a big fan of Valve’s Steam platform as that is how I buy all my games now but for the most part had remained locked to the PC desktop and more recently the Mac desktop. Word from Redmond Pie is that an unofficial Steam app created by IBF Programs for Android handsets running 1.6 or better. Make sure you realize this is an unofficial app and isn’t supported by Steam itself but at this point the app will let you check you public profile on Steam, see whether any of your friends are online or playing a specific game. As well you can check for any updates to any of the groups that you belong to and you can browse through the special offers that are always being made on Steam. Summary Tab: Selecting this tab shows the relevant Steam profile based on user credentials provided along with the most recent games played. 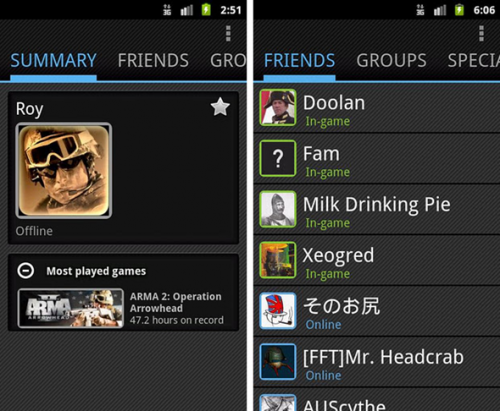 Friends Tab: An exhaustive list of the users friends, including whether or not they are currently online, in a game or have recently played a game. Groups Tab: All of the users groups of which they are a member. Also displays general information about those groups. Specials Tab: Displays the specials deals currently available on the Steam store ensuring users don’t miss out on price reductions. Favourites Tab: Displays a list of friends who have been tagged as favourites. The app is also extremely bandwidth friendly by only downloading the information pertaining to the selected options. All of the other tabs remain “asleep” until they are selected. If this happens to be up your alley here is the download link for it in the Android Marketplace.